There are a depressing amount of auto accidents on Florida roads, for a variety of reasons – anything from bad weather to driver error may be responsible. However, there are some types of accidents that are more dangerous than others, with none being more potentially hazardous than a rollover. 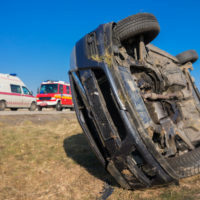 If you have been through a rollover accident in Florida, you are likely quite lucky to be alive, and you may be able to seek compensation from the other driver if the crash was due to their negligence. The National Highway Traffic Safety Administration (NHTSA) reports that in 2010, only 2.1 percent of the approximately 9 million auto accidents on the road were rollovers. However, almost 35 percent of the recorded fatalities were sustained in those accidents. For a variety of reasons, rollovers are far more dangerous than most other types of car crashes, most notably because there is a total loss of control. In a head-on or rear-end collision, the driver may retain control of their vehicle. This cannot occur in a rollover by definition. Rollover accidents generally occur because something affects the vehicle’s center of gravity, which is why more SUVs and trucks are involved in rollovers than standard automobiles. A car is less likely to flip because its center of gravity is lower, though it is decidedly not impossible for it to do so. Speed is among the most likely culprits in causing a rollover accident, because if a car is speeding and something hits or moves the car, the center of gravity may be affected, making it more likely for a vehicle to flip. Because so much is going on during a rollover crash, there are multiple potential legal theories under which compensation might be sought. The most common is negligence, under which a plaintiff must show that the defendant driver’s conduct breached the duty owed by drivers to one another, and that it caused tangible, real harm to the plaintiff (more than cuts or bruises). In a negligence case, a plaintiff may possibly recover for their medical bills and for things like lost wages if they prevail, though comparative fault may reduce their recovery by the percentage that they themselves are found to be at fault. Another possible legal theory under which many rollovers go to court is one of product liability. Very often, a driver might bring suit against the automobile company that made their car, or against the manufacturer of a subsidiary part such as the tires. If there is evidence that the car was more likely to flip over, or that a part like a tire or steering column was less likely to function properly in an emergency, a plaintiff may be able to recover in product liability, since such a product would likely be deemed dangerous. Obviously, the best theory under which to bring suit will vary from case to case. If you have been injured in a rollover accident, you almost certainly have serious injuries for which you may be entitled to compensation. The Orlando rollover accident attorneys at the Hornsby Law Group can sit down with you and try to help answer any questions you may have, which can help you see how best to move forward. Contact our office today at 866-300-5468 for a free consultation.